Debra has enjoyed working in public radio for 28 years. The first 16 years as a reporter and News Director at the NPR station in Houston. Debra studied to be a radio journalist at University of Texas at Austin She has been creating pictures through words and theater of the mind ever since. 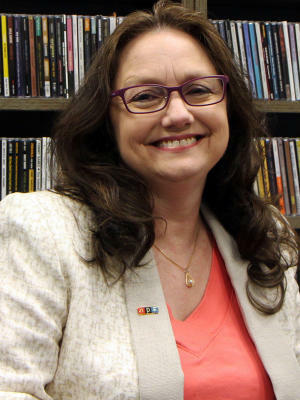 Debra joined the KMUW team in mid-2014. She considers it a privilege to do what she enjoys with exceptional people! In her role as General Manager, Debra leads all aspects of the station on the air and in the community. She connects content, outreach and fundraising with the station’s goals. She has a decade of experience identifying the most effective and efficient combinations of departments, individuals and partners. Her mission is to help make Wichita even better. Debra believes KMUW should have an active role in efforts to energize and transform this community’s culture and economy. She wants KMUW to tell the vibrant stories of Wichita to Wichitans and to the world. The relocation of KMUW to Old Town is driving the accompanying outreach through projects such as Engage ICT: Democracy on Tap and a fall outdoor concert series. Coming from the Texas Gulf Coast, hurricanes and flooding are a fact of life. Neither are preparation for Kansas earthquakes, tornados and wildfires. Disaster planning has been one of the more interesting adjustments. KMUW is licensed to Wichita State University and is considered a veritable front porch to the great things happening at WSU and in Wichita. Debra serves as chair for the Kansas Public Broadcasting Council, Vice President of the Old Town Association Board and is new to the WDDC Board.